John Mandryk, as his name suggests, has long held a fascination for Dutch Ice yachts. Their heavy timbers, bow sprits and tops’ls are lovely, and the absolute antithesis of the modern ice boat. They persist in Holland, however, and each year a few more are built in spite of the trend toward warmer winters. John, who sails on Deep Creek, Maryland, high in the norther Appalachians put his yacht together over the past couple of years. 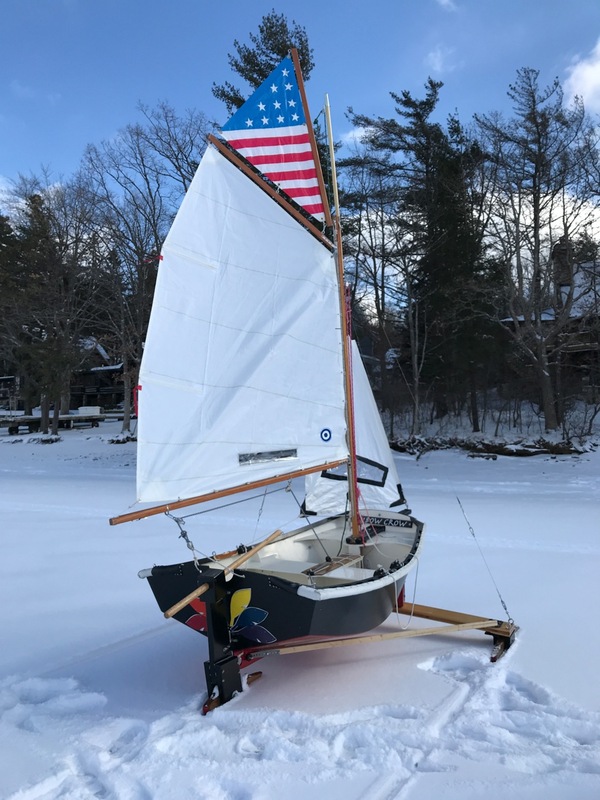 In spite of the snow and light wind he reports that it sails ok, but looks forward to better conditions for more complete sea trials. Speaking of Maryland, good ice is now reported as far south as Atlantic City, and it might just keep on southbound if this weather continues. Great South Bay on Long Island is frozen shore to shore, and there has been some sailing on the Navesink at Red Bank but the snow that’s supposed to whallop us here in New England Thursday is hitting there, as well. Could we be holding the NA’s in Annapolis again? This entry was posted on 01/02/2018 by Commodore James "T" Thieler DN US 5224. It was filed under 2018 Season .